In this tale of the circus and hell-raising. 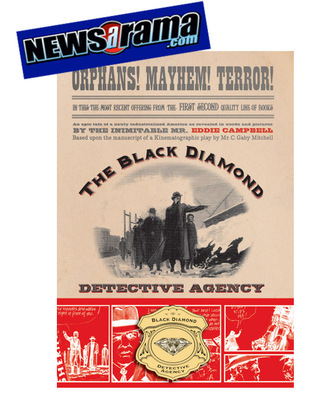 Mixing a mystery that keeps you guessing until the very end with great action sequences and compelling characters, The Black Diamond Detective Agency may have been intended for the screen, but it’s hard to imagine how the story will ever surpass the treatment it receives here. You can smell the air of Chicago in 1899, and John Hardin is one of the most engaging protagonists to grace the printed page in recent memory. Definitely recommended." Read the rest of the article at NewsARama. Others have posted about this, but it's too good to pass up on Doodles & Dailies Two excellent Australian podcasts that should add to the ongoing conversation about FATE OF THE ARTIST! The second is a fifteen minute interview with Eddie -- great fun -- for a Western Australia radio show titled Faster than Light. Apparently they recorded over half an hour with the intention of boiling it down to half that, but they liked it enough to run the whole lot as a two parter. above is part 1 with presumably another to follow soon. "Readers of The Fate of the Artist looking for some other Eddie Campbell oddities are directed to the site of Bent Books Australia, where they will see displayed a dozen caricatures of famous authors (see how many you can name) on the store's exclusive bookmarks. Eddie draws six of these each year for Sean MacKinnon , who is reprtedly one of his dearest drinking buddies, and is looking forward to tackling the next set when he finishes the long awaited Black Diamond Agency next week. Look for that book in First Second's Spring 2007 releases. Last we heard, Eddie's wife has got him on a gluten-free diet of cider. Sean MacKinnon was not available for comment. " 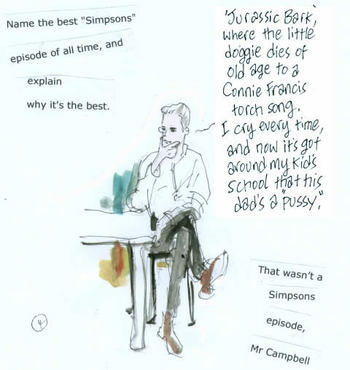 By far my favorite interview yet of Eddie Campbell can be found at at the Powell's Website. Eddie answered in cartoon form. Don't miss it. More to come with First Second luminaries at the Powell site. Powell's, by the way, is the largest independent bookseller in America (I think) and my first and favorite stop whenever I'm in Portland. My favorite Simpsons episode is the one where Bart sells his soul to Milhouse. And it's actually a Simpsons episode. Mr. 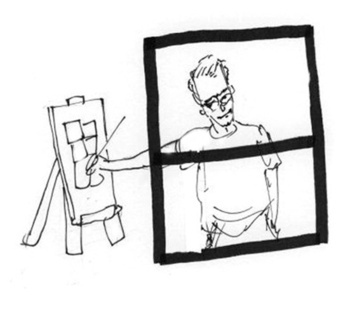 Rob Salkowitz at Emphasis Added gives a blazing wildfire of a review to Eddie Campbell's Fate of the Artist. 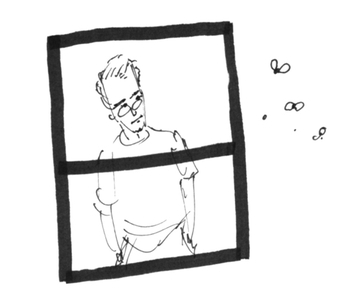 Salkowitz places his reflection on Eddie Campbell's book squarely in the modern artistic dilemna, and you can read it all on his blog here. Reading The Fate of the Artist is one of the most life-affirming activities I’ve done all year. Every page gives you something to think about if you’re so inclined, or you can sit back and enjoy Campbell’s skill as a storyteller (and appreciate his craft as an excellent and inventive illustrator). But in my opinion, it’s always worth celebrating when someone at this late date in our decadent era of cultural exhaustion still finds the motivation to explore the knotty issues of art and philosophy, and is able to pull it off in such grand style. There's a whole gamut of provocative material to be found in the rest of the article. Should stoke the fires of FATE OF THE ARTIST discussions for a while to come. Campbell decamped from the UK in the late 1980s to take up the life of a family man in suburban Australia. In his advancing years, he has turned into a “lovable eccentric” within the comic community – the kind of figure that the Gen-X editors now enthroned at the various publishers will give some work to when they want to seem edgy and adventurous. Maybe he's talking about Marvel or DC. I'm too old to be Gen X anyway. And I'm not enthroned, I have a tiny office in the Flatiron building. Must be Marvel or DC. Diary of an author, waiting. part 21. 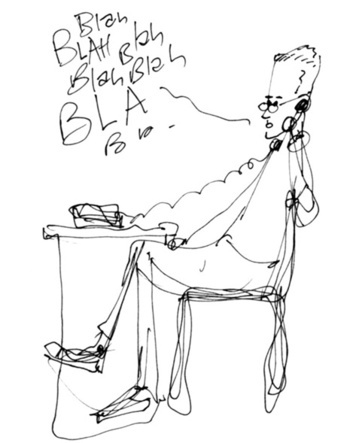 Now that he's done waiting, the author can't stop talking.